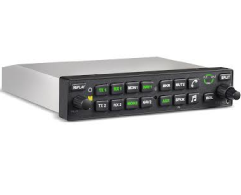 The AMX240 is a full-featured audio source selector panel, intercom, and Marker Beacon receiver that provides outstanding features and sound quality, while incorporating Avidyne’s legendary “Flying Made Simple” user interface. Large, easy-to-read, LED backlit buttons provide simple mode selection and at-a-glance annunciation of your current audio and intercom configuration. Supporting three transmitter inputs, nine receiver inputs, plus two inputs for stereo music and five unswitched inputs, the AMX240 also features a six-place high-fidelity stereo intercom, public address (PA) function, plus Bluetooth® music and full-duplex cell phone interfaces. Dual radio monitor capability allows the pilot to listen to Standby frequencies on the Avidyne IFD-Series VHF radios with automatic muting when active frequency is in use. A dedicated Replay button provides a “say again” function that repeats previous ATC communications, and a dedicated Split button allows the pilot to transmit on Com 1 while the Copilot transmits on Com 2. The PMA8000 series is a direct slide-in replacement with the GMA340 audio panel. The PMA8000 can even come with a Bluetooth® interface. Several advantages of the "BT" version is the elimination of wires and an improved user interface. The PMA8000 audio panel is FAA TSO and European ETSO approved.